No matter how much we deny it, people can’t get enough of celebrities. There’s something about a famous face that just gets people excited – which probably explains some of these completely random celebrities in video games! On the face of it, Bruce Willis’ involvement in Apocalypse is fairly straightforward. He plays a scientist who has to shoot his way through the legions of Hell to stop his ex-colleague, a chap called the Reverend, from destroying the world with the four Horsemen of the Apocalypse. However, Bruce wasn’t always supposed to be the main character. He recorded his lines as a sidekick to the main character, and it was only long after Bruce had clocked off and taken all his lovely voiceover money to the bank that Neversoft decided to recast him as the hero. As a result, Willis spends most of the game wisecracking to no-one and only has about 4 lines of dialogue. It makes poor Bruce seem slightly mad to be honest. Interestingly, Neversoft later used the Apocalypse game engine to make Tony Hawk’s Pro Skater, with Bruce Willis’ character acting as a stand-in skater during early demos. Technically, Bruce Willis is responsible for the entire Tony Hawk’s franchise! Saints Row: The Third is crazy, but no-one could have foreseen that none other than Burt Reynolds would crop up as the fictional town of Steelport’s mayor. But there he is, a vision in a white Stetson and a strong moustache (and with plenty of women, too). To make things even weirder, Reynolds enlists you to help him defeat a horde of zombies, which is hardly an offer you’re going to turn down. Once you’ve helped Burt beat his undead nemeses, he becomes your ‘homie’ and sends a SWAT team to help you kill rival gangsters. Cheers, Burt! The King of Pop appeared in quite a few games (including his own, the legendary Moonwalker) but none quite as inappropriate as the comedy boxing game Ready to Rumble. Decked out in various costumes from his career, it turns out that Jacko packs quite a mean left hook. Who’d have guessed it? The Grand Theft Auto series is packed with big names, but only one of them has actually appeared as themselves in a major plot line: Phil Flippin’ Collins. Phil is on the run from assassins, who are after him due to money issues caused by his manager. Your mission is to protect Phil and get him to a concert in one piece. After surviving a hail of bullets and the company of Mr. Collins, you’re ‘rewarded’ with…an in-game performance of In the Air Tonight. Great! True Crime is essentially Grand Theft Auto from the other side of the law. You roam the streets preventing crime rather than committing it. As well as starring in the game, Snoop also contributed a song to the soundtrack. Do ex-presidents count as celebrities? We’re going to say yes, because this scenario from Black Ops is just too amazing to leave out. First things first: yes, there is a Fight Club game – and it’s terrible. You might wonder how Justin Bieber, who is quite short, would fare in a professional basketball game. The answer: he wouldn’t. 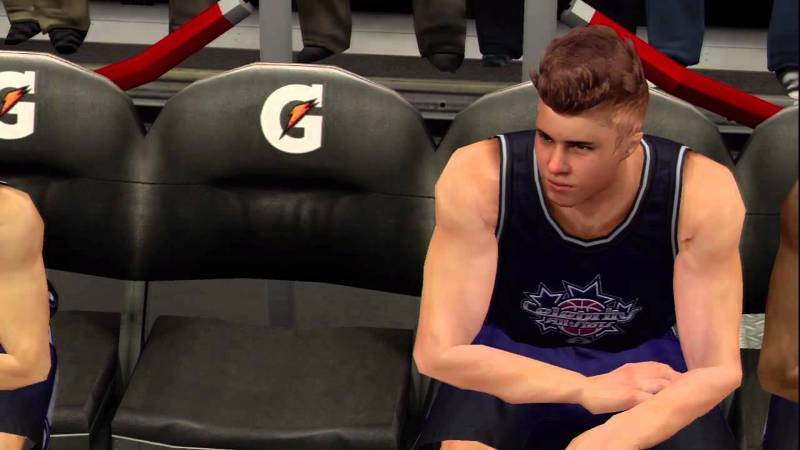 Instead, the makers of NBA 2K13 decided to make Bieber 7 inches taller and ramped his stats up so he’s pretty much the best player in the game. While there have been other celebrities in NBA games, Biebs is undboutedly the most controversial; imagine EA Sports putting Joey Essex in FIFA and making him better than Lionel Messi and you’ve pretty much got the levels of outrage Super Bieber caused. Would you like to sell games? Then click the button below and get an instant price! ← The best of E3 2015: Fallout 4, Shenmue 3 and more!